Being a recipe developer means that I translate a recipe into something - either video or written - that other people can follow. I normally test the same recipe in the kitchen for at least a few times until I get it right. 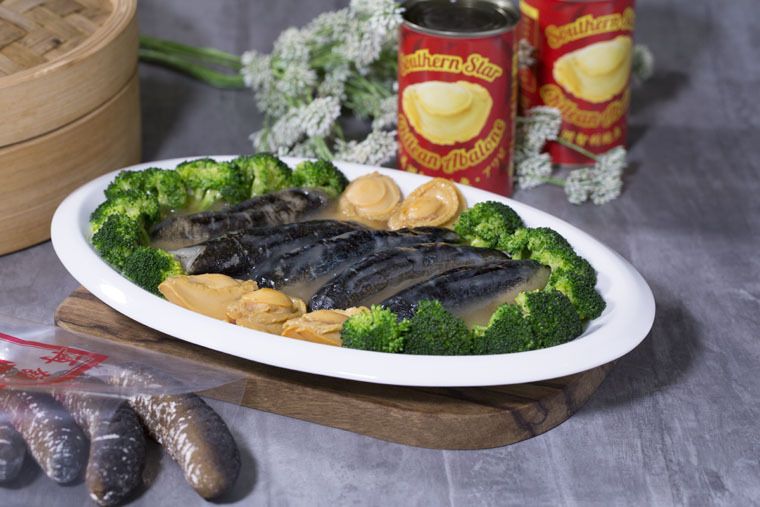 When I was commissioned by Chai Huat Hin to come up with a recipe using sea cucumber, an exclusive and expensive ingredient popular for Chinese New Year, I knew I had to make sure the first try is right. So I seek help from a dear friend's grand-aunt who used to own a popular Chinese restaurant in Pudu. So this recipe that you are getting is of a good Chinese restaurant standard. Step 1 TO MAKE SUPERIOR STOCK: Place blanched chicken, lean pork, and water into the slow cooker. Cook on HIGH for 1 hour. Then cook on LOW for another 5 hours. Strain the liquid and discard ingredients, leaving only the broth. Step 2 Leave 1.5 cup of soup for making the sauce.Pour the remaining broth into small containers to freeze. Step 3 BRAISE SEA CUCUMBER: Add sea cucumber, ginger, and white sections of spring onions into the pot. Pour in enough water to cover sea cucumber. Bring to a boil and braise until softens. Alternatively, place it in the slow-cooker/thermal cooker to cook overnight. Step 4 STEAM ABALONE: Steam abalone in the rice cooker or wok for 2 hours. Step 6 SERVE: Arrange sea cucumber, abalone, and broccoli on the plate. Pour sauce over and serve hot. 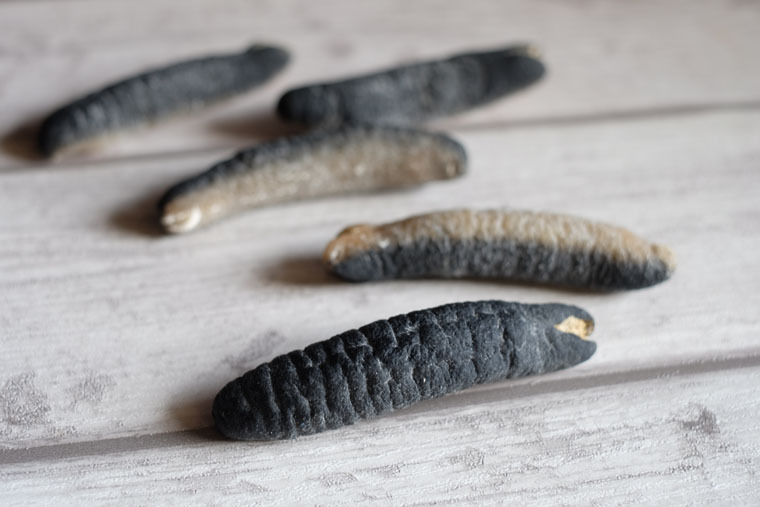 Buy soaked sea cucumber I have soaked the sea cucumber for 7 days. Boy, it was a lot of hard work! You have to make sure that there is no single drop of oil - otherwise the sea cucumber will rot. That means you'll have to make sure your hands are always clean, the bowl is cleaned thoroughly, and that you change the water daily. My advise? Buy soaked sea cucumber. It saves so much time and effort! Southern Star brand Chilean abalone I used Southern Star brand Chilean abalone with 5 pieces of abalone in it. This abalone is more chewy than soft. Cook canned abalone in the rice cooker This step is to soften the abalone. You can also steam the can in the wok. However, a rice cooker is much more convenient. If you use a big rice cooker, you can put in enough water to steam it for 1 or 2 hours easily. Make superior stock ahead. You can make this stock way ahead of Chinese New Year. The recipe given gives you more than the recipe needs. I like to keep them separately in clear glass containers. You can also keep them in ice-cubes and use them for cooking small amount of food like stir-fry vegetables. Blanch the broccoli in salt water This flavoured the broccoli from inside out, retain its nutrient, and ensure that the colour is bright green. Go easy on the cornstarch Put the cornstarch slurry little by little to avoid the sauce from becoming too thick. This Chinese New Year, why not try to impress your family with this exclusive dish?